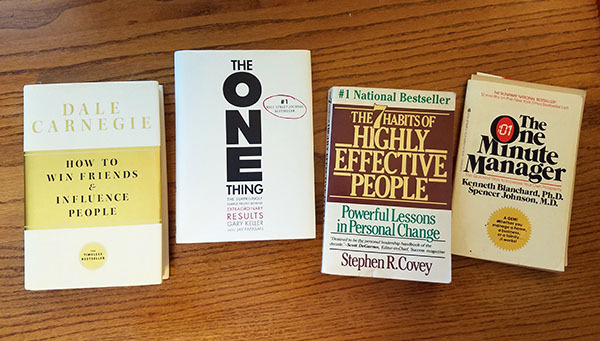 This time around – we focus on career and productivity books. 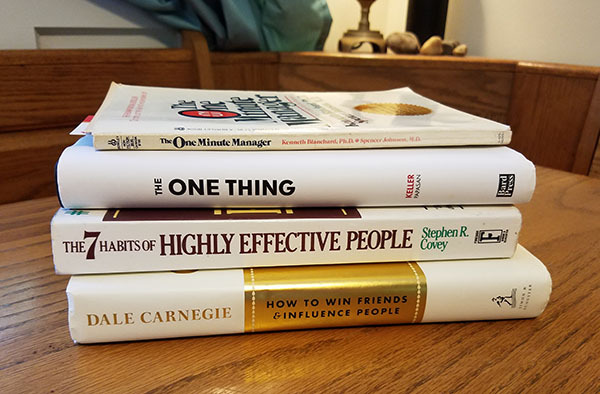 Bundle of 4 Great Career Books! What’s a great hack you’ve done in your life or career lately?? Hope you’re finding some good ideas, even if you haven’t won anything yet! Mine is called “Career gratitude hack”: I list all the things I love about my job and all the things I’m proud of rather than moaning about the few things I don’t like and “comparing and disparaging” with friends I perceive as doing better in their careers. Last year, I completed part of the freecodecamp.org curriculum, mostly while spending endless hours on the couch nursing my newborn. That gave me the last push I needed to start my own blog. My wife and I both aligned our schedule for the next school year so we both only have to leave the house on the same day (Tuesday). We can work from home the other four days! I’ve created a more flexible schedule and found a better work/life balance. Damn I need those books! I’ve finally found a work/life balance by reducing my hours and being strict about saving specific days and times for family and volunteering. During my lunch break, I close the door to my office and read something positive and inspiring. I’ve found a job that I actually love doing. I job hopped for years and have found that right now I am satisfied in the new position I’m in at a job that I’ve never done before. I make a list of what I want to achieve daily in a calendar. Lately I’ve been calling my credit card companies immediately when I get the bill in the mail. I set up a payment for two days before it is due just to make sure it goes through by the due date. That way I’m never late and I don’t have to set up automatic payments. I did that once with Verizon and it was kind of a hassle. You know I always love it when you stop by here and drop the knowledge! Thank you, sir! A great career hack I try to always do (because I have a bad memory) is each time I meet someone new or catch up with a network contact I haven’t talked to in a while, I write 2-3 sentence note about them. “Went to Penn State, 3 kids, oldest getting married in June”. It really helps to keep your networking connections strong, shows you care and pay attention. People love to know they have been heard. I’ve become more active on LinkedIn. Because of this, I’ve had recruiters contact me directly, I’ve made more connections in the areas I want to get into & I’ve learned a lot of great tips from reading the articles of the people I follow. The best productivity hack I’ve done the last year. Cancel my cable package and start using the StayFocusd app to limit mindless website usage. It’s amazing how much time I wasted watching commercials or flipping through “news” feeds. I’ve had much more time to do more meaningful things and feel much happier. I cut my works hours and stopped multi tasking. I stay in the zone and focus on one thing at a time. Whether it’s various tasks at work, family time, cleaning or some other time. I’ve seen a positive improvement in my work productivity and ability to be happier and accomplish more at night. Also, I create calendar events for even the smallest tasks so they have an allotted time. The best thing I have done lately for my finances (and peace of mind) was to start up a $75/week auto-deposit into a new Index fund for my long term savings. I already have a small emergency fund that I add $40 to every week. I don’t make a lot of money, so I was worried that all this saving was insanely high, that I would drain my account and I probably would have to eat oatmeal for the rest of my life. Right on!! You will totally be invited!! I have a pretty big one for me personally…I found out this week that my landlord is putting the 4 apartment house that I rent from on the market. I’ve been renting all of my adult life. I am taking steps to purchase the house from her – …which means buying my first rental property ever! When I got the news that she was going to be selling, but that nothing would change for the first year under new ownership, I initially thought I’d probably have to move out in September 2019…but then someone asked me if I’d ever consider buying it… from all my reading of investment properties through FIRE, it’s been something I’ve thought about, but have been too lazy to look into moving. This appears to be falling into my lap – as I take the first steps towards my first rental property and love that I already live there. I also work 5 minutes away, so am close by. 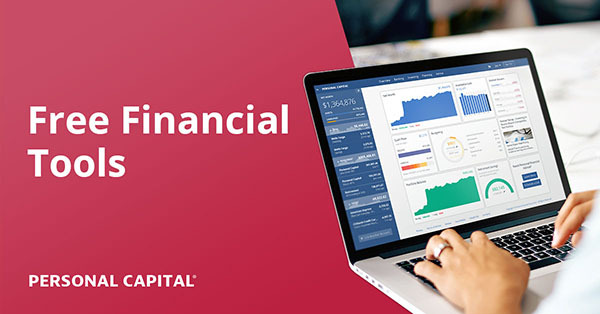 I owned my own business for 9 years previously, but have been in the office-life for the past 3 – now I’m ready for the next step in both my financial circumstances and life-investments! So excited! There are already 3 other tenants in the house, and we are 3 minutes away from a college – so there are always going to be college students nearby for renting and I’d look for longer-term renters as well! Fantastic! Hope it all goes smoothly and no random/scary surprises! I’ve been automating as much as possible. I had a hard time giving up control of bills, but finally gave in to automating things like our mortgage, utilities, etc. It saves me time and I can still keep a close eye on it. I just gave notice at work, which will end my 1 hour each way in traffic commute! 3 years ago I stumbled upon the FIRE bloggers, and started “super saving”, stashing $3,000 to $5,000 per month in a Vanguard account in index funds. I also whittled our expenses down slowly. Now we have a huge cushion and I can afford to work part-time at a job that will be biking distance from my house. I’m SO looking forward to hours of my life off the freeway and more time to be present with my family, and not stressing over work. Taking back my life energy!! My “hack” is that I pay for my utility bills in full and budget the whole amount, but I have a roommate who reimburses me for half the expenses. Depending on my savings goal for the month, it’s either fully invested or fully saved because I don’t budget for the reimbursement. If my roommate were to ever move out, I’m still covering the full amount, so I wouldn’t be able to get the extra savings, but it’s a nice unbudgeted boost ever month to see my savings account or investment account go up. Using a Kanban board with 3 columns to organize tasks: Things to do, Things I’m working on, and Completed tasks. I created mine in OneNote so it’s easy to access from anywhere and it’s easy to drag and drop activities between columns! Before I leave work, I make a list of things I would like to do for the next day. When I come in to work the next day, I prioritize my list and add in anything extra that my attorneys might have added for me to complete. I cross them off as I complete them and at the end of the day I start a new sheet for the next day carrying over what I had not had time to finish. At the end of every workday, i create a To Do list for the next day of what needs to be accomplished. That helps to frame my day and helps me focus. Auto payments for all bills. I don’t ever have to worry about having a late payment. Saves me time and money (some places actually give a discount when you auto pay or pay online). Q: What’s a great hack you’ve done in your life or career lately?? I love this! I’m not quite Steve Jobs but do a similar thing. I do not want to waste time and energy shopping/thinking about/laundering/choosing work clothes! Created a LinkedIn profile to passively look for career opportunities (I’m currently employed) , and just recently was offered an opportunity from a Recruiter to apply for a position with a much higher salary. After a couple rounds of interviews i was given an offer ! Moved my emergency savings from an account with an 0.15% interest rate to an account with a 1.75% interest rate. Free money! I opened 529 accounts for both my children when they were very young. Now 1 has graduated and the 2nd will graduate in 3 years. They were both able to go away to great 4 year colleges and will have less than $30,000 in student loans to pay off. That beats the $80,000 of loans I had to pay off when I graduated 27 years ago!! Because I started early for them I was still able to fully fund my retirement account each month also. Getting rid of my car! I recently (April) got rid off my car and purchased a moped and I could not be happier! between insurance and gas I easily save $2,200 a year and that’s not even getting in to how much less expensive repairs and maintenance costs! plus for the days with especially bad weather there is public transport (a lot of which is free where I leave because of the near by university! It was cool that you won – the *frugality* package at that! I’ve been trying to implement the “Touch it Once” policy. I want to deal with pieces of paper or emails or website links as fast as possible, to get them off of my to-do list, so I try to take care of it as soon as I touch it (or open a link). I got into a habit of picking things up once, putting it down, leaving 10 website tabs open on my computer, and it can quickly get overwhelming. So now when I get a piece of paper in my hands, or an email in my inbox I go think to myself “what can I do to take care of this issue so I never have to touch this piece of paper again”. Work has become much less stressful since I began implementing this policy. I started riding my bike to work this week. I’m already seeing a positive difference in my fitness and overall attitude. My “hack” I guess you can call it, is applying for jobs even if I don’t meet all of the requirements or have all of the years experience. Have to try and get your foot in the door somewhere and if you’re a great/hardworker with a great attitude that will show through and somebody will take the chance on you. I’m going to throw two in here since I’m not sure the first one really counts as a hack. My wife is switching jobs soon and her new job doesn’t allow her to contribute to the 401k until after 1 year of service soooooo… we increased her contributions so she will max out her 401k on the next paycheck before she leaves her current job. She’ll be eligible at her new employer next July so we can save up enough money to put a big chunk of each paycheck into her 401k for the second half of next year. This way we don’t miss out on any 401k contributions this year or next year. And if that doesn’t count as a hack (timing the change in jobs so its at the middle of the year) then we also just completed our first international trip in recent years and her flight was “free” (only had to pay the taxes) as we used our southwest companion pass from opening up both a SW premier and SW plus credit card for 50k points each. Not really sure if this is a hack or not, but recently I started working on improving my stress management and productivity at work. Every morning when I get to work (6:30am), I take 30 minutes to set myself up for the day. I split up the notes section in my planner for the day into two columns. On the right, I list my meetings and important times for the day. On the left, I write tasks. I always start with “Update Planner” because I then get to cross something off immediately. Then “Inbox Zero” is always second, because it’s something I strive for every day. I then re-write any uncompleted tasks from the previous day, plus any tasks I need to complete for the new day, based on priority and importance. It’s a small section to write in, which allows me to limit my task list to things that I can actually achieve in one day. And I write EVERYTHING down. If I need to send an email to remind someone to do something, I write it down. If I need to go for a walk to blow off some steam, I write it down. This allows me to cross off actions throughout the day, which makes me feel that I’m making progress on big projects that take months to complete. I break them down into small chunks that I can complete and feel like my day was productive. It has seriously improved my stress and allowed me to not feel as overwhelmed by all the projects I’m currently juggling. It also keeps me on top of things and therefore I meet my deadlines sooner. I still get thrown for a loop when priorities change, but it’s easier to manage now. Being a one car family is a one hack we have been able to work out. Fortunately me and my wife have different work shifts so we can drive the same car to work. I’m a 9-5 shift whereas she does the overnight shift. If their was a situation where she needed the car during the day, I can take the bus to work as a plan B. Threw my TV out of a window!! Todoist and Any.do for task reminders and tracking. I’m actually in the process of doing it. It involves starting a new business where I must provide a payment method for the goods, and I don’t trust the company enough to give a credit card – though it is a company widely thought of as reputable and well-known. I’m looking to open a checking account that gives cashback on debit card usage. I never thought I could have a use for debit cards, but think this circumstance fits it well. And that book collection #4 looks pretty good! Package #2. My son just graduated and starts his first career job in July. I’d love for him to start off on the right track with his finances!! He has a bright future as long as he doesn’t follow the herd!! A brilliant collection of books are being listed. I just read a few of them. Now, I will read the rest. Thanks for sharing. Previous post: Giveaway Day #3: Bundle of Frugality Books! Next post: Giveaway Grand Finale! *12* Money Books!